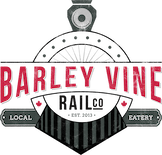 Barley Vine Rain Co. aims to connect Canadians to a dining experience in the same way ingredients are connected to food and a train connects us to friends and family across our beautiful Country. We take pride in Absolute Guest Satisfaction as you travel with us across our Nation and enjoy the tastes of how diverse and Multicultural this Country is whilst providing happiness and joy through, food, music and art of this Amazing Country that we are. Wed 11:30 a.m - 9 p.m.
Thurs: 11:30 a.m - 9 p.m.
Fri: 1130 a.m. - 11 p.m.
Sun: 11:30 a.m. - 9 p.m.